Photos by KATHY CLEVELAND Norma Weinberg answers gardening question after her recent presentation for the Amherst Garden Club at the Messiah Luthern Church. AMHERST – Dandelions are so easy to despise, as their yellow flowers give way to coarse, flat leaves that mar our carefully cultivated lawns and a tap root that seems to go all the way to China. Norma Weinberg wants gardeners to embrace their dandelions – or at least tolerate them. 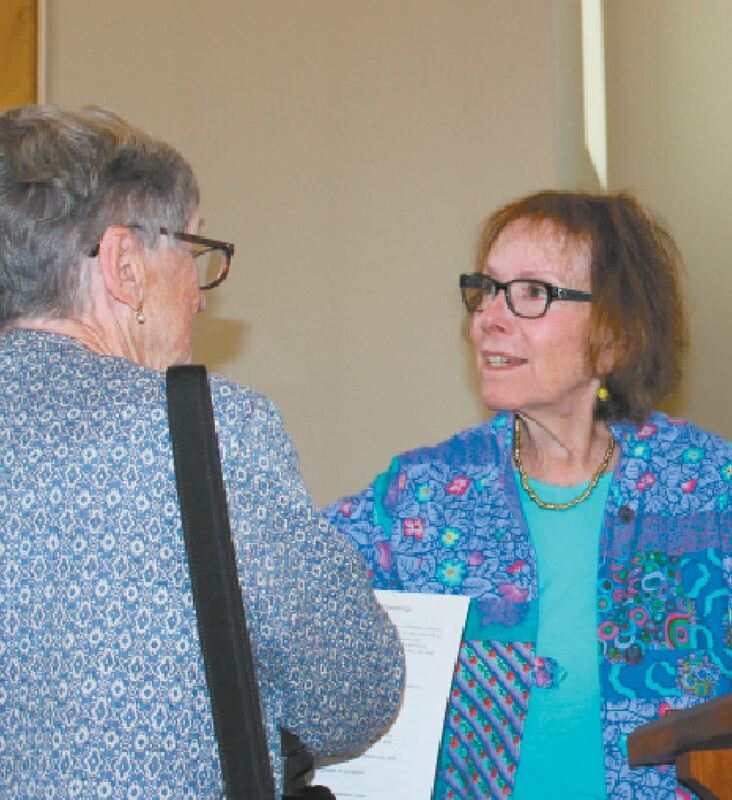 In a recent presentation before the Amherst Garden Club called “Herbs Through a Sustainable Lens,” Weinberg talked about how dandelions were brought here by the Puritans, who considered them a health and digestive aid. In the lawn or garden, that sturdy tap root breaks up soil and makes it more hospitable for earthworms. Its roots are loaded with beta carotene and its leaves have lutein, which is good for the eyes. By “sustainable,” she means causing no harm to the Earth and its valuable resources. Weinberg is a master gardener with the Massachusetts Horticultural Society. She is the former chairwoman, and now education chairwoman, of the Herb Society of America. â¢ Make friends with your weeds, especially dandelions. “For me, a weed is a plant I haven’t yet discovered a use for,” Weinberg said. â¢ Use a soaker hose instead of a sprinkler hose and use a timer to turn it on early in the morning. â¢ Use mulch. A good one is chopped leaves mixed with grass clippings to provide nitrogen. â¢ Use ground covers, such as wild ginger. â¢ Use a broom instead of a hose to clean up walkways and driveways. â¢ Create a habitat for beneficial insects, including those that pollinate and those that are predators or parasites on harmful insects. Beneficial bug-eating birds and animals include turtles and birds. â¢ Use native plants such as ladyslipper, goldenrod and Joe Pye weed. They are drought tolerant, and do a better job of providing food and shelter for native birds and animals. â¢ There’s a lot to be learned from plants’ Latin names. Yarrow’s name, for example, Achillea millefolium, comes from the myth of Achilles, the Spartan hero who used it to stop his soldiers’ cuts from bleeding. “Buddy planting,” or companion planting, is when plants repel each other’s pests or bring nutrients to each other, such as basil with tomato plants or marigolds with vegetables, because the fall flowering plant releases toxins through its roots to kill nematodes. Sap-sucking insects such as white flies and aphids like to feed on nasturtiums, which draw the pests away from vegetables.